An international team of researchers has developed a new method to assess the intelligence and personality by analyzing neurophysiological data of the human brain. There are some members from Universidad Politécnica de Madrid among the international team. Researchers from the Centre for Biomedical Technology (CTB) at UPM and from Yuri Gagarin State Technical University (SSTU) have assessed the electroencephalogram (EEG) recorded during performing elementary cognitive tasks and have found a link among the EEG characteristics, mental abilities, and personality traits. The results, which have been published in the PloS ONE journal, can be useful in the trials and the diagnosis of personal skills to perform complex operational tasks. The reliable and objective assessment of intelligence and personality has been a topic of increasing interest in contemporary neuroscience and psychology. It is known that intelligence can be measured by estimating the mental speed or velocity of information processing. This is usually measured as a reaction time during elementary cognitive task processing, while personality is often assessed by means of questionnaires. Besides, human personality affects the way a subject accomplishes elementary cognitive tasks and, therefore, some personality features can define intelligence. 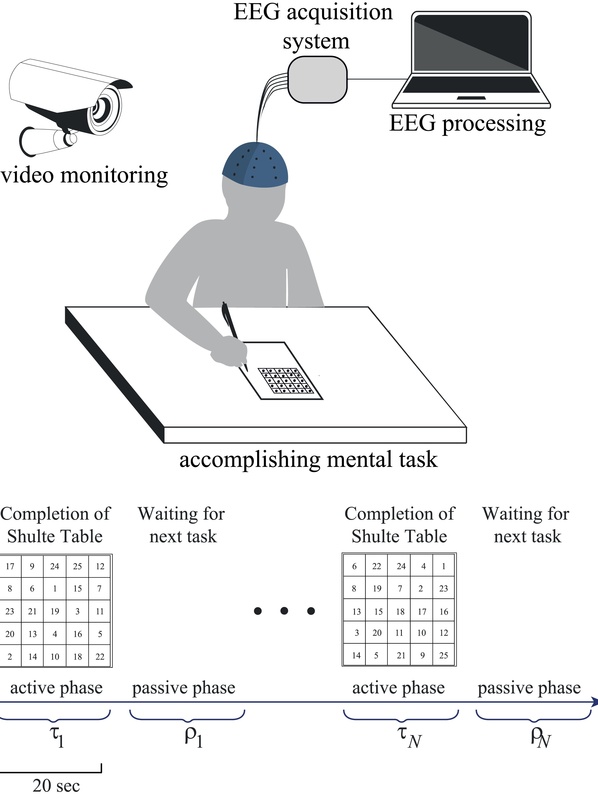 It is expected that these features, as well as mental abilities in performing cognitive tasks, are associated with the brain’s electrical neural activity. Although several studies reported a correlation between event-related potentials, mental ability, and intelligence, there is a lack of information about time-frequency and spatio-temporal structures of neural activity which characterize this relation. Illustration of the experimental procedure. The Schulte test is a 5x5 table of random numbers from 1 to 25. The subjects have to find the numbers in descending order, first the largest number (25), then the next largest number (24), etc., up to (1). During the active phases, the subject has to note down each number. Credit: A. Pisarchik et al. Researchers from CTB, at UPM and SSTU analyzed human electroencephalograms (EEG) recorded during the performance of elementary cognitive tasks using the Schulte test, which is a paper-pencil based instrument for assessing elementary cognitive ability or mental speed. Alexander Pisarchik, a researcher from the Ageing Lab at CTB and an author of this research says: “According to particular features found of the EEG structure, we divided the subjects into three groups. For subjects in each group, we applied the Sixteen Personality Factor Questionnaire (16PF) to assess their personality traits. We found that each group reached a different score on the personality scale, such as warmth, reasoning, emotional stability and dominance”. Subjects from the group I could immediately perform unknown tasks and maintain their working efficiency at a relatively high rate, above a medium-low level. The psychological decryption of the tests included the remarks about the creativity in the test performance and fast switches to new tasks. Relation between energies of high- and low-frequency spectral components in the left, calculated for active and passive experimental phases. In the personality test, such subjects had a pronounced tendency to work alone, high intellect, analytical mind, critical thinking, intolerance to uncertainty, and a delay in decision making. Moreover, they exhibited self-control, a lack of anxiety, a pronounced leadership, and a desire to dominate in the group. These results suggest that the creativity and the attempt to optimize their work led to a decrease in their working efficiency. The subjects from group II tried to develop a strategy to simplify the task performance. During the accomplishment of the first task, a maximum lateralization of high-frequency activity was considered, for instance, the activity in the right hemisphere was much more pronounced. This means that during the first task, the strategy was not yet developed. During the next tasks, the burden in the right hemisphere in these subjects was reduced. As a result, the subjects from the group II demonstrated higher working efficiency than the subjects from group I. These subjects needed little time for adaptation and did not get tired, being capable to effectively maintain a high working efficiency for a long time. Their personal profiles harmoniously combined high scores in intellect, emotional maturity, and self-control. Unlike group II, the subjects from group III accomplished the task without any attempts to develop a strategy to simplify it. This was confirmed by the psychological test. Researchers assume that the subjects from this group have difficulties to maintain high working efficiency for prolong time. Their personality tests showed a pronounced preference to work alone with low self-control, intolerance to uncertainty, and a delay in decision-making, that can be manifested by anxiety. They also demonstrated high intellect, analytical mind, critical thinking, and a spirit for experimentation. “Summing up, we found a link between EEG features, mental abilities, and personality traits. It is remarkable that the intelligence, which was lower in the subjects from the group II and did not reflect the creativity in the development of new strategies, resulted in very high work performance”, concludes Pisarchik. The obtained results can be of great interest for testing human personality to create automatized intelligent programs which combine simple tests and EEG measurements for real estimation of human personality traits and mental abilities.